Violent Bob Ross and Steven ‘Ocho’ Peterson are crowd pleasers with an exciting style, and they’ve been paired up at UFC Nashville. Luis Pena, a.k.a. 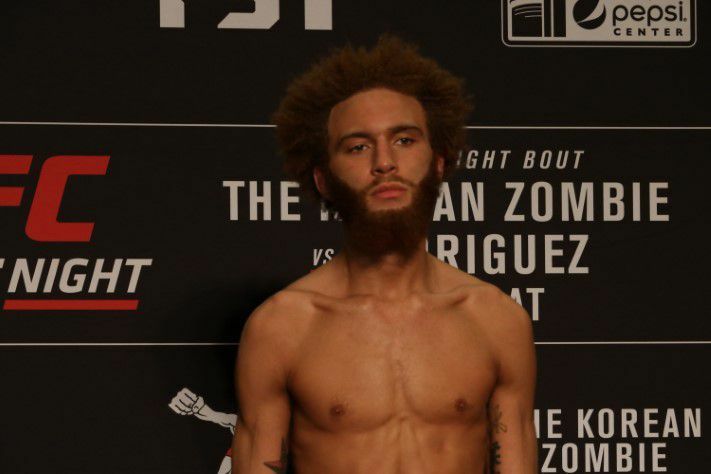 Violent Bob Ross, is bringing his artistry to the featherweight division. On Monday, the former TUF competitor and popular lightweight confirmed multiple reports of a fight with Steven Peterson at UFC Nashville. The event, numerically UFC Fight Night 148, takes place in Nashville, TN on March 23. Anthony Pettis vs. Stephen ‘Wonderboy’ Thompson headlines. Pena (5-1) was forced off The Ultimate Fighter 27 due to injury, but returned to win his inaugural UFC bout at the finale. Following that victory, he was paired up with TUF 27 winner Mike Trizano, who served up the first loss of VBR’s career. Now, it’s a move down to the featherweight division for the lanky Pena, where he’ll take on Steven ‘Ocho’ Peterson. Peterson (17-7) is another two-fight veteran of the UFC. Having also fought on the TUF 27 finale, he’s been out since, following a win against Matt Bessette. ‘Ocho’ has also appeared for Bellator and Legacy over the course of his career. UFC Nashville goes down at the Bridgestone Arena, and will air live on streaming service ESPN+. It’s part of a busy month for the UFC, which has five events scheduled for March.